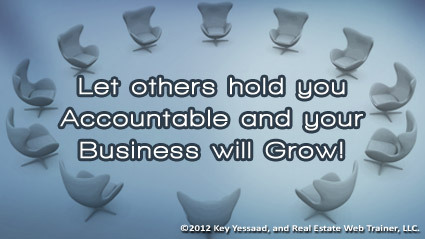 The Best friend of a Real Estate Professional is Accountability; the Worst friend of most Real Estate Professionals: themselves. For some reason Mediocre Agents tend to hang out with other mediocre ones; while the smart and savvy agents surround themselves with a network of driven professionals – why is that? When you boil down the day to day activities of Real Estate Agents you will notice that those activities must be undertaken by the agent themselves, no one tells them what to do; in fact they don’t like to be told what to do, which leads many to plan and execute their prospecting plan alone. Prospecting is really grueling, those who have mastered it have come to understand that the No’s you get are necessary steps to the few great Yes’s you need to succeed in prospecting; but No’s sting the heart and resemble rejection – so many end up stopping their prospecting which destroys their source of new business. Accountability to others forces the agent to stop answering to themselves, and start keeping their word with others – it is bizarre but true: Most people will do what they say when told to others, but fail to do the same if told to themselves. It is fully integrated with Ali Express; I felt like I could highlight millions of products from China on my store and the best thing to know is that they were offering great profit margins. Zero up 2.0 app can literally turn China into your own store https://www.salesfunnelhero.com/zero-up-2-fred-lam-review/ ?..